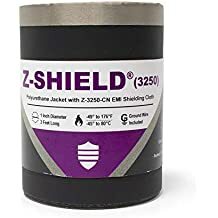 Zip Shield 3250 - Emi Jackets And Expandable Sleeves - Emi Shielding - Products - ZT | Zippertubing Co. The Zip-Shield® (3250) are developed by Zippertubing are advanced cable management product that are easy to install and remove. Our Zip-Shield® products are unique in that they feature an exterior protective jacket that is heat sealed to the pressure track closure with the additional benefits of adding our Z-3250-CN EMI/RFI protection shielding materials to the configuration. These products have been field tested for many years and provide excellent shielding results with an all-in-one solution. 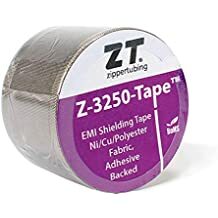 Z-3250-CN EMI shielding fabric is a .004-inch-thick, woven Nickel over copper-plated polyester taffeta cloth that provides outstanding EMI shielding performance. The thin-woven polyester construction makes Z-3250-CN extremely flexible, yet very strong, and provides excellent corrosion resistance and resistance to environmental degradation. It is, without doubt, the most versatile of all Zippertubing's EMI shielding products and can be incorporated with almost all of our jacketing products to provide a thin, lightweight and very flexible shield. The cloth has an electrical resistance of less than 0.1 ohm/square, provides shield coverage of approximately 98% and averages 85 dB of attenuation from 10 MHz to 20 GHz. This is Zippertubing's most popular shielding material.